Wantable Fitness Edit has been around for years, but they just announced in December that they were expanding to include plus sizes, and I could not be more excited! I signed up right away! In addition to Wantable Fitness Edit for Women and Men, Wantable also offers a Women Style Edit Clothing box. Wantable now does exchanges, hooray! They included this card with details about the new service. I think the word “winter” here refers to the type of floral print – otherwise, I can’t think of anything winter about this chiffon, semi-sheer, short sleeved top! 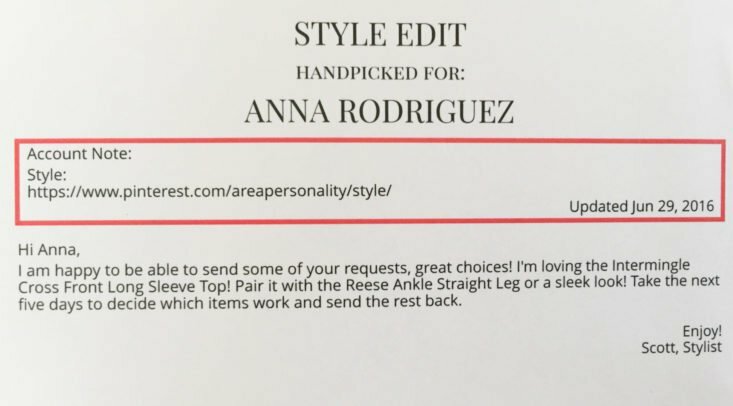 Wantable has a feature called the “Stream” where they showcase some of the items they are currently sending out in their styling boxes, and if you see something you like, you can request it in your next box. This was something I requested from the Stream, and I couldn’t be happier with it! I chose it because I do love the colors and print, and I am very happy with the way the colors and print look in real life. I am also very happy with the fit, and the neckline is cool, too! This is a keeper! I think the “it” item for this fall must be a solid pair of heavy cotton olive utility or cargo pants because every styling service I subscribe to has sent me at least one so far. These are really cute, and I usually love everything from Kut from the Kloth, but these are just too tight. It’s a shame because they are a great length! I actually already have this exact cardigan in black except it was made by Kiyonna. I am wondering if this is meant to be an exact copy, actually, because they are strikingly similar. This is a cotton knit, and I think it is just a bit heavier than the same cardigan by Kiyonna. The fit on this is not great; I feel like it’s almost a little too big on me. This will also need to go back, unfortunately. I’m not totally sure, I might be missing something, but I think Wantable sent me this exact same tee a few months ago, which I kept. It is super cute! It’s pretty basic, in the standard cotton weight for tees. I like the fit and cut a lot, which is probably why I kept it the first time around. This top just looks terrible on me. I’m sorry I can’t put a more positive spin on it, but it’s just not working. Aside from being too long and made from a clingy synthetic blend, it has a weird built-in bra. Why? There’s really no danger of the straps showing from my regular bra. This is definitely going back. I am starting to get some pieces for fall, but it’s still 90 degrees here. I am not ready for this kind of heavy knit. I also don’t really think this is very flattering on me. It’s too long and a little too big also. While it was technically possible to get these jeans onto my body, the “super skinny” moniker is no joke in this case. I feel like when I model clothes that are too tight, even though it is unflattering, it helps you to understand whether a styling service is paying attention to my size and the fit of the clothing they are sending out. It’s supposed to be a good thing. But, even I have my limits. These were almost painful. It’s too bad, again, because they are a good length for me, and I like the wash a lot. Unfortunately, these will have to go back as well. The Verdict: I really love my Wantable Style Edit! Having said that, this month was really unlucky for me. I say unlucky because I feel like sometimes that’s all it really boils down to. They did send me a duplicate of a tee they sent previously, but I think the other picks were just not a good match for me. I do love the floral Kensie top, though! I feel like, in terms of cost and value, Wantable sends a good mix of inexpensive and pricier pieces. I also love that they send seven pieces, it’s so fun! Value Breakdown: This box cost $20.00 with free shipping and returns. The total retail value of the items inside was $478.00. The cost of each item is listed alongside it above, but if I choose to keep at least 5 items, I get a 20% discount. The $20.00 cost of the box would also be applied to the purchase, meaning I would end up spending $362.40 for the whole box. Ultimately, that is a savings of about 24%. The average price per piece is $68.29. Check out all of our Wantable Style Edit reviews, the Women’s Subscription Box Directory and the Plus Size Clothing Subscription Box Directory! I don’t see the coupon for Wantable anywhere? Lovin the grey one although I feel you. It is still 99 here in Vegas and although the boss is freezing me out with the air conditioner it is hard to get dressed in the morning. Thanks Michelle! Yeah I cannot wait for this weather to cool off!